This table is very sturdy and easy to put together if you follow the instructions. I did use a socket wrench and a power hex drive and was careful not to over tighten. The wood is really high quality and the height is perfect. Playing surface is top notch. Great buy. Time to take some of my buddies’ dough. An ultra-luxurious design with classic details, this transitional style game table will blow minds with its removable wooden cover and multi-functional design. The two available wood finishes are paired with a leatherette rim, flannelette center, cup holders, and chip slots for a piece that is as practical as it is stylish. Dimensions 88.0 In. X 46.0 In. X 31.0 In. Our family LOVES this game table! We use it with and without the cover - removing it regularly, and have had no issues. It's very high quality and has held up to abuse from 3 boys and all their friends ages 8-13. 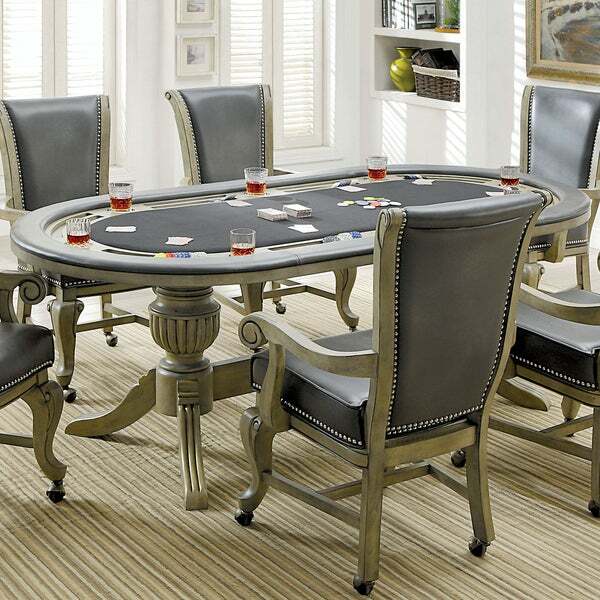 From black jack and poker to family board games, we love using this table. It's definitely elegant to go in a dining room if you need to save space. the color is fantastic for our farmhouse-feel home! I ordered this cherry poker table a couple months ago, and it is everything I wanted. The table and base are heavy duty and good quality. Product comes in two boxes. Great product and great value got it with 20% off! This table is a awesome addition to any man cave/game room!!! The removable top gives you the option for dinner or a hold'em game in a matter of a minute. The only advice I would give is pay the extra money to have delivered to the room of choice because the box it comes in is a thee person effort to move. Awesome investment for my game room! The table is solid and high quality. Arrived quickly, easy to assemble, but you my need a partner, it is very heavy. "Is there an option to add the chairs?"